Mantis religiosa - one of the largest Mantids in my country. leangth - 8cm. Here it was shot demonstrating its warning pose - standing up with its wings unfolded, showing its warning colors and making hissing sounds. its my first time to catch it doing this show. later on it just ran away quickly. it is a common specie in Israel. Fantastic macro Oz. Excellent composition with very good sharpness and very good details. Excellent POV and very nice colours. Very good job. Well done. Thank you for posting. Woow OZ! The most in pose!! Wonderful in every aspect. Wow - Oz - that's marvelous. What an impressive pose and all the details with the spots on the legs and the opened wings - I love it. The others have said it all. Well done. Hello Oz , A Great shot ,what a pose from the mantis , beautiful , good sharpnes details pov bg and colours , good job ,Greetings Teunie . Excellent image, great detail! Not something one normally sees. Well done. very impressive posure and capture. Well selected focus plane. Nice details and natural colours. Superb general composition. Excellent shot of this Mantis with all the attributes of a good close-up with the special pose being a bonus. Well done. I like the composition and the sharpness is also great. And of course you have caught Mantis in very impressive pose. This macro is ncredible. Interesting object and pose. Excellent capture with good details. WOW! 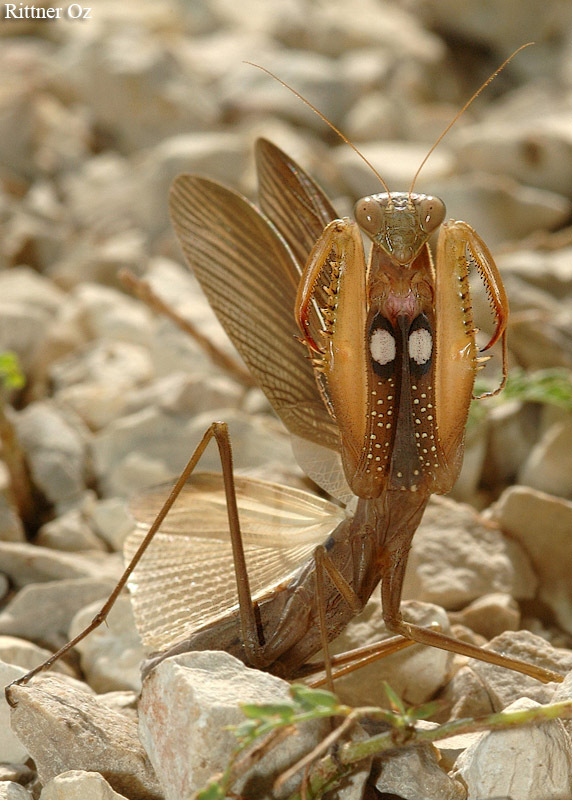 What a magnificent pose here by this mantis you managed to capture here! Truely impressive this behavior of her's! The POV is amazing and the details are great and perfectly sharp. Also the lighting is very well managed and the exposure is spot-on. Onr of the best poses of mantis I have sen in TN. Congratulations. The overall quality is good too. A nice post, TFS. Superb point of view, very unusual. Very good details. The colors look natural. Well done. (I guess you had to lie down in order to get this shot). Excellent capture of the mantis - perfectly posing for the camera and perfectly captured. What an incredible pose, Oz. and of the ventral view. Fantastic POV with sharp details and great composition. What a great moment you caught. Another great macro estimated friend with excellent point of view and sharpness. I like it a lot: composition, focus, sharpness, POV, DOF, color, background, lighting, framing. excellent observation and capture of patterns and behaviour that does not fail to frighten me even when seen on a screen. A magnificent documentation of interspecies communication of mesmerizing intensity. very nice shot,I like the detail sight on this mantis.Perfect macro. Very nice shoot, very excelent. Today - for the beginning - a photo of mantis species in self-defence position. Great timing and fantastic details. I had oportunity to observe this species (the only species of Mantodea occurring in Poland) in such positions but it was to difficult to take a good photo of such behaviour. So here are my best congratulations! Great shot! I have never seen a mantis like this before! Sharply focussed and good POV.